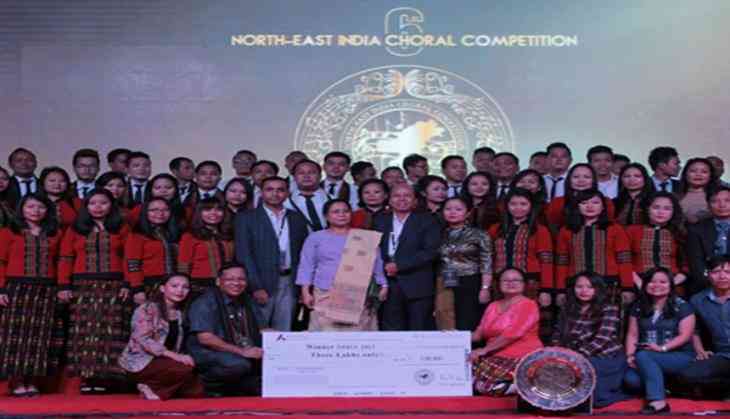 The sixth North-East India Choral competition (NEICC) recently concluded with a marvellous celebration of singing with participation from several North East India Communities. As the theme of the competition- 'Togetherness'- suggests this competition united the various communities as one in spirit. The proud winners were Independent Church of India (ICI) Delhi; with Poumai Baptist Church Delhi coming second and Tangkhul Church Delhi grabbing the third place. The winner took home a trophy and a prize of Rs. 3 lakh while second and third place winners collected prizes of Rs. 2 lakh and Rs. 1 lakh respectively. NEICC 2017 was held at Thyagaraj Sports Complex, with a strong gathering of around 2,000 people. The event has gone from strength to strength since its inception in 2012. This year, the prestigious competition featured nine choirs from around the North East India Communities. Losii Dikho and Nemcha Kipgen, Cabinet Ministers, Government of Manipur graced the event as Chief Guests. The Judges of the choral completion included Lindsay Boyd, Mira Boyadzhieva and Priya Wacziarg Enzel. Numerous talented artistes from the North East also performed at the event. NEICC is an event that encourages and gives platform to talented musicians from the North East India communities. The event was divided into two sessions; a Choral Competition followed by combined worship service. Music is a common denominator that unites different faith and culture. Jim Joy of Global Harvest Ministries International was the main speaker at the event. His message resonates with the theme of 'Togetherness' exhorting all to 'walk in unity'. NEICC is curated by the Tangkhul Christian Charitable Trust (TCCT), a non-profit body destined for the less-privileged masses, with special attention to the North East.